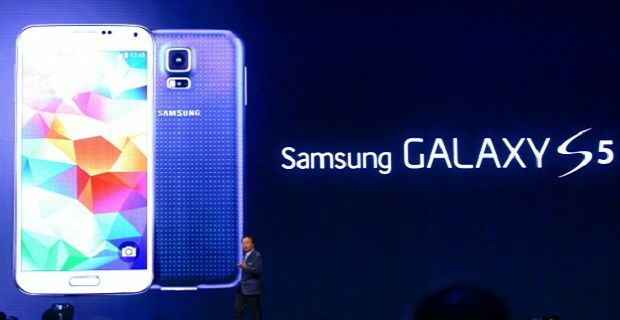 Samsung used the Mobile World Congress at Fira Gran Via in Barcelona to launch its latest smartphone. A packed crowd saw the Samsung Galaxy S5 launched after a long intro from Barcelona Opera House's chamber orchestra. Samsung has gone “back to basics” with its latest creation so you won’t find too many surprises. The standout features are the water-resistant case and the phone’s new fingerprint tech which is used for locking the device. Other than that, there are improvements to the camera and a new power saving mode which will extend the phone’s battery life by 24 hours by switching the screen to black and white and limiting its capabilities to texts and calls only. Samsung’s VP Jean-Daniel Ayme was happy to show off the S5’s power save mode but he wouldn’t be drawn on release information, which we understand will be at the end of March at the earliest, or the phone’s price, which some reports suggest will be lower than its predecessor. Before the phone’s launch, there was talk of a new design language for the new phone, so we were expecting the S5 to look quite a bit different from the Galaxy S3 and S4. There’s a hint of Samsung Galaxy Note in the phone’s design, especially the metal surround that reminds us of the Note 3, but other than that, there’s nothing new in the S5’s look. Samsung has changed the back of their new phone which is now sturdier and feels better in your hand. The overall structure is a lot more solid but the phone’s bigger than the S3 and S4. The waterproof case is new though. Last year’s Samsung Galaxy S4 Active, which arrived after the S4, added a waterproof case which is the basis for the water-resistant case found here.